You know a Greek Mythology says that humans were originally created with four arms, four legs and a head with two faces but eventually fearing their power Zeus split them into two separate beings condemning them to search their other half for the rest of their life. Wow! If I believe that then I am still in search of a person who is ‘me’. How amazingly our human brain is designed, it automatically ponders on myths like that and leaves our inner-self into the mystery. There are many mysteries around us and I think Oscar Wilde has rightly said, “The true mystery of the world is visible, not the invisible.” In this post too, I am going to take you on the verbal journey to a place where the mystery is visible and leaving its traces from ages. So let us take our spades and dig deeper to unfold the “Mystery of Mysore”. 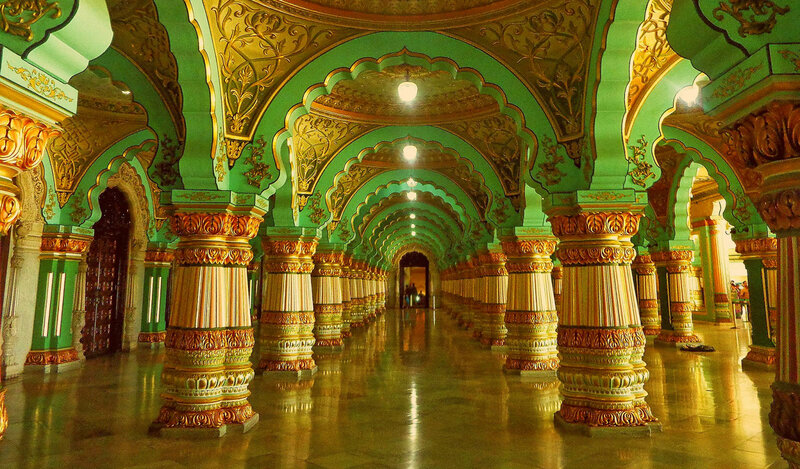 Have you been to Mysore? Then you must have certainly visited the Amba Vilas Palace, aka, The Mysore Palace. The royal gates, the fabulous garden, grand architecture and mind blowing paintings seem to be surreal and take you to the time when Royal’s ruled. The hypnotism of the beauty of palace is such that your quench seems unsatisfied when you are not allowed to click photos of the remarkable interiors or discover those hidden tunnels or the restricted areas. But the breathtaking sensational view of one lakh bulbs in the evening just mesmerise you and satiate you in all regards. That’s it, this is what you thought of Mysore palace? Then let me tell you missed to unveil the Mystery of Mysore, the tale which is still alive. Don’t be grumpy on yourself, let me take you to the flashback. When a king dared to take the jewellery of a woman and got a curse which cannot be lifted till date. When I came to know about this clandestine I swear I felt shaken from inside. The saga is 400 years old when Raja Wadiyar defeated the viceroy of Vijayanagara, King Tirumalaraja and conquered the fort of Srirangapatnam and expanded the boundary of his Mysore dynasty. Trimularaja with his two wives then had to shift to Talakad, a small town near Mysore on the banks of river Kaveri but unfortunately, he died soon due to some disease. Alamelamma, one of his wives, owned a large amount of precious jewellery which included an exquisite nose ring with a large pearl. She is the great devotee of Sri Ranganayaki offered her jewels for decorating the Adi-Ranga temple in Srirangapatnam for ceremonies but kept the custody with herself. As you all know when there is some treasure of jewels involved some conspiracies do happen. So, here too it happened but the climax took some ugly turns and after knowing this I bet you would never touch the jewels of a female. It is said that temple authorities asked Raja Wadiyar to take the custody of the jewels which belongs to the temple. Assuming that Alamelamma is a widow and jewels are of no use to her, he sent his delegates to ask for jewels from her. She gave the precious nose pin and denied to give any other piece of jewellery to them. Listening to her denial, Raja Wadiyar sent the soldiers to recover the precious ornaments from her. This made her furious and she eloped with her jewels but she could not escape from the army and reached a cliff facing river Kaveri. Her royal blood didn’t know the point of return so she jumped into the river with her box of jewels. But before jumping she cursed in agony saying, “Talakadu maraLagali, Malangi maduvagali, Mysuru doregaLige makkalilllade hogali”. This meant, Let Talakadu be buried in sand, May Malangi end in the whirlpool and may the kings of Mysore never ever have children. The curse soon devastated Raja Wadiyar with the sudden death of one of his sons on the eve of Dasara celebrations. Then the King ordered for a gold statue of Almelamma and from then her statue is worshipped as the deity on every 9th day of Dasara celebration. But this could not save the empire from the wrath of her curse and after 400 years too, the royal family has not been able to beget a male heir. 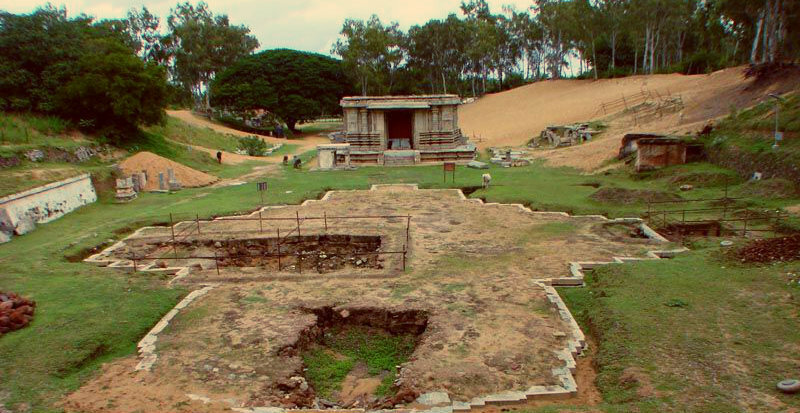 Over the years, Talakad city also got buried in the sand and Malingi is ending up in the whirlpool of river Kaveri. I have read somewhere that old gossips eventually become the Myths and 400 years is a long period of time. What do you feel? Ye sab kehne ki batein hai. Okay, let’s find out the secret behind the mystery of Mysore with some logical calculations. Firstly, as far as sand enshrouding the Talakad is concerned it is justified with building up of a dam in close vicinity to the city. This dam is dry and thus the sand in the river bed with time has covered the city due to the strong wind current which flows towards Talakad. Secondly, about Malangi turning into a whirlpool, geologists have proved that due to the active fault in the flow of River Kaveri it has changed its course covering Malangi. Most of you must be thinking,” I knew there must be a scientific reason and all this is just a story.” Then let me shake you from inside and give you goose bumps. Why is it that from 1700 six of the Wadiyar Kings had to adopt sons from their relatives? Like science you too don’t have answers, right? So after knowing it all, does it mean that all the doomed happenings in Mysore and concerned environs are because of the curse? Let me excite you even more about the place. There are even instances which state that Almelamma’s presence has been felt in the Mysore Palace several times. Your heart must be going OMG, there are so many answers to be found! I would say pack your bags and visit this palace once again and tell me how different it was visiting the royal abode after knowing this mystery of Mysore. For those who have not been there, I have only one thing to say, you have missed one of the most beautiful and intricate monument of India. Mysore, the third largest city of Karnataka is very well connected with other parts of the country. By Air: The nearest airport to reach Mysore is the Bangalore airport which is approx 180km away and very well connected with other major cities. By Road: Mysore is very well connected with the road network. There regular buses from Bangalore. You can take a KSRTC bus or a taxi from Bangalore railway station to reach Mysore and other major cities like Mangalore, Mumbai etc are also well connected with Mysore. By Rail: Mysore also has the good connectivity of the rail network too from major cities. There are also many express trains which run frequently between Bangalore and Mysore.